A very dirty hamster cage not only is foul-smelling, it can be dangerous to your hamster. A dirty cage can cause health and psychological issues. Ideally, you should be cleaning your hamster's cage every day -- but chances are you haven't been doing that if it's now very dirty. Move Fluffy to a safe container, such as a second cage or a deep bucket. Then put the container in another room, where you can close the door to keep him safe from other pets or in case he accidentally gets loose. Throw away all bedding and any lining material -- such as newspapers -- you've placed at the bottom of the cage. If you have a wire cage, you might need to unclip the base in order to completely remove any leftover pine shavings or small pieces of paper caught in the corners. Remove all water and food bowls, as well as any toys made of plastic or metal. Place everything inside a bucket filled with warm water and dish detergent. Let everything soak while you're cleaning the cage itself. With a dirty cage, there's always the risk of bacterial contamination reaching the toys or bowls, so you want to clean every accessory well before you put these things back into the cage. Use vinegar or a pet-safe enzyme cleaner to clean the cage. Even with a very dirty cage, you shouldn't be using bleach or other toxic products, which linger after you rinse the cage and can be dangerous to your furry one. Use a brush to clean the cage. Make sure you clean all corners and brush off any stains or marks you might find while cleaning. A very dirty cage might have dried feces stuck in the corners or urine stains on the bottom tray. Make sure you clean those off thoroughly. Brush the sides of the glass tank -- if that's what you have -- using white vinegar if you see urine stains. You might need to do this several times to loosen up tough or scaly stains. If the stains don't come off after a few scrubs, fill the tank with a mix of warm water and white vinegar and wait 10 to 15 minutes for the stains to soften. You can then dump the water and scrub one more time using a brush or a paint scraper. Rinse the cage with warm water several times, until all remnants of cleaning products or vinegar are gone. Then dry using paper towels. If the smell of vinegar is strong, rinse again and let the enclosure air-dry for an hour or so until the smell becomes less intrusive. Hamsters have sensitive noses, and vinegar could be bothersome to them. Use the brush to clean all bowls and toys before rinsing them thoroughly. Dry them before returning them to the cage. Make sure the food and water bowls don't smell like soap, or your fluffy friend might refuse to eat from them.  Make sure the cage or tank is completely dry before adding new bedding or cage liners. 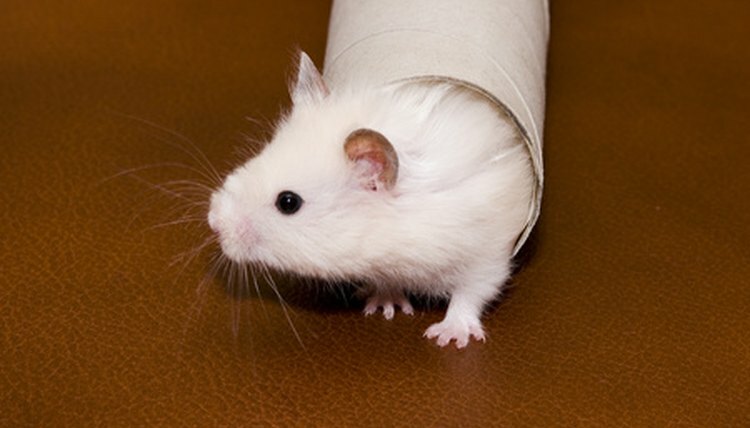 Wet bedding or paper can grow bacteria that can make your hamster sick. Critter Cures: How Often Should I Clean My Hamster’s Cage? What Is the Most Common Cleaning Method for Removing Bird Droppings?